We are pleased to announce the release of Dorico 2.2.10, a free update for existing Dorico Pro 2 and Dorico Elements 2 customers, which adds a variety of workflow and productivity enhancements – including auto-save and a new feature to flip items – and fixes a number of bugs across the application. If you want to grab the update and go, check out the Dorico 2.2.10 Version History PDF for full details of all the improvements, and then download the updater via Steinberg Download Assistant. Although Dorico is generally a stable application, unfortunately it’s not impossible for it to crash, and if you’re unlucky enough to experience a crash, the last thing you want is to lose any work as a result. With the introduction of auto-save in Dorico 2.2.10 this concern should, we hope, become a thing of the past. Dorico will save the active project every few minutes (the default interval is five minutes, which can be adjusted in the Files section of the General page of Preferences). 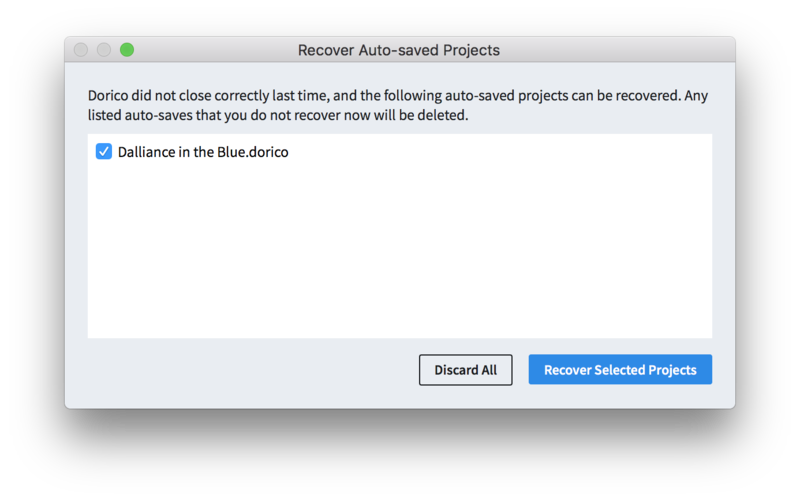 If Dorico crashes, the next time it starts up, you’ll be shown a dialog giving you the chance to recover the auto-saved version of the project. If you choose to recover the project, it will be opened up, allowing you to choose where to save it. If, on the other hand, you choose to discard the auto-saved project, it will be deleted immediately, at which point it’s gone for good. So it’s a good idea to at least take a look at the auto-saved project to be sure you’re not throwing away something you would miss. A few things to note about the way auto-save works: firstly, if you have multiple projects open at once, only the project that is active will be auto-saved when the timer expires, because only the active project has up-to-date audio engine state, which is required for saving (so if you typically work with multiple projects, you might want to consider reducing the default auto-save interval to increase the likelihood that all projects will be auto-saved); secondly, the project will only be auto-saved if it is dirty, i.e. if it has unsaved changes; thirdly, auto-save does a full save, which means that for larger projects it may take a moment or two, and Dorico may appear sluggish or unresponsive during the auto-save operation. To disable auto-save, deactivate the Auto-save every n minutes checkbox in the Files section of the General page of Preferences. This is also where you’ll find the settings for where the auto-saved files should be saved: by default, this is a folder called AutoSave inside your Dorico Projects folder, itself found inside your user account’s documents folder. Taken together with the existing feature that rotates backups when you save manually, the addition of auto-save should give you increased peace of mind that you will not lose any work unexpectedly when working in Dorico. Edit Flip has the default key command F: simply select the item you want to flip, and hit F. Of course, F is also the key to type to input a note with the pitch F during note input, so Flip can’t be used via the keyboard when the caret is shown. To reset the effect of flipping an item, you can of course simply flip it again, but this isn’t the same as resetting whichever property or properties is involved in causing the item to flip. For most items, you can choose Edit > Reset Appearance, but there are exceptions, such as stems and beams, which must be reset using Edit > Stem > Remove Forced Stem. 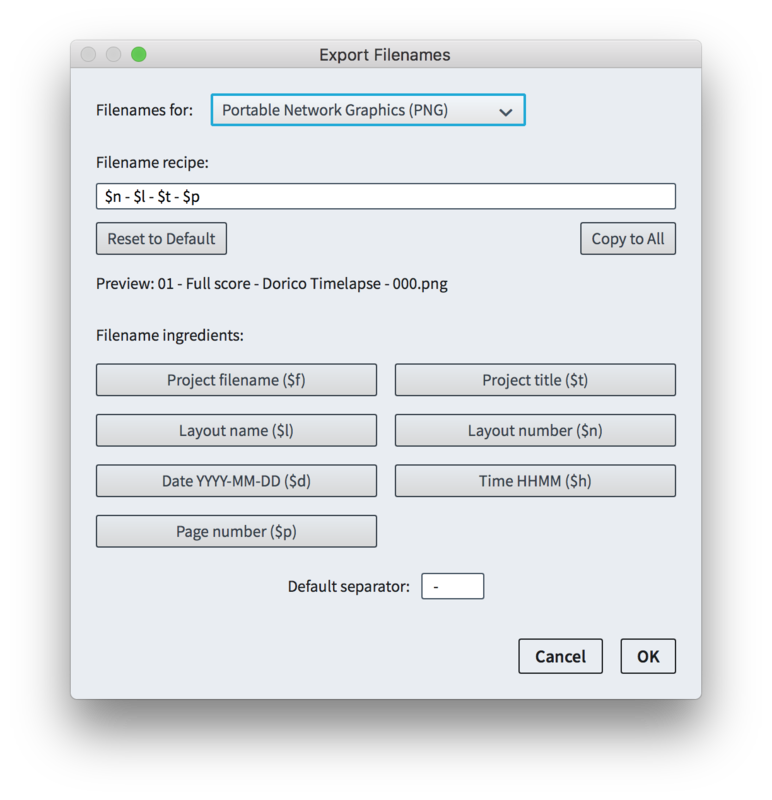 Some Dorico users may not know that Dorico can export graphics in a number of bitmap (PNG, TIFF) and vector (PDF, TIFF) formats directly from Print mode: if you’re currently using a PDF printer driver – for example, Microsoft Print to PDF, PDFCreator, or similar – we strongly recommend that you use Dorico’s built-in PDF export. To export PDFs directly from Dorico, in the right-hand panel in Print mode, click the Graphics button in the Destination section, then choose PDF from the drop-down listing the export formats. More information can be found in Dorico’s online documentation. This bears pointing out because Dorico’s built-in PDF export is almost always the correct way to create PDF files from your projects. Using a PDF printer driver may introduce problems with incorrect margins, page sizes, font embedding, colour profiles, and so on. Dorico’s own PDF export will always use the page size you specify in Layout Options, with precisely the right margins, it will handle any embedded graphics correctly, and if you specify the option to export in monochrome, it will produce a true black rather than a rich or process black, which is necessary for correct output to monochrome imagesetters or digital printing machines. Each token can be added as an ingredient to the overall recipe for the filename, and tokens are provided for the project title, layout name, layout number, project filename, the current date and time, and page number. Each graphics format has its own recipe, though it’s possible to copy the recipe from one graphics format to any or all of the others, if you want them all to be the same. Do beware that only PDF allows you to export multiple pages into a single exported file, so for PNG, TIFF and SVG you should use the $p ingredient to make sure that the page number is included somewhere in the filename recipe. The recipes are saved in Dorico’s preferences, so you should find that this is a “set and forget” operation. In direct response to a couple of threads on the Dorico user forum from users who unfortunately managed to get all the way to a rehearsal, only to find to their horror that they had printed out parts for transposing instruments in concert pitch, we have added a simple pre-flight check for printing and exporting graphics to try to prevent this from happening again. Dorico provides you with the flexibility to view any score or part layout in either concert or transposed pitch: this can be changed at any time by choosing Edit > Concert Pitch or Transposed Pitch, and the transposition state for the current layout is always shown in the status bar read-out at the bottom left-hand corner of the window. It can be useful to proof-read a part layout for a transposing instrument like Horn in F or trumpet in D in concert pitch, particularly if you find reading transposed pitch difficult, and you may well wish to print it out in order to read it more closely: but when the part is printed or exported for rehearsal or performance, of course it must be printed in transposed pitch. Simply click Change Transposition to correct the transposition and then proceed with the print or export operation. One of the major improvements in Dorico 2.2 was the introduction of real-time MIDI recording, and Dorico 2.2.10 brings further refinements to those features. Firstly, a number of bugs concerning recording into repeat structures, recording into flows after the first flow in a project, and recording into additional staves for instruments or into players holding multiple instruments have been fixed. Secondly, Dorico now respects the setting in the Write Input Pitch submenu, to choose between written or sounding pitch, when recording as well as in step-time input. Thirdly, there have been even more improvements to the quality of the default transcription produced for MIDI recording and for importing MIDI files, including more sophistication in the transcription of tuplets in irregular meters. In addition to these refinements, Dorico 2.2.10 also includes a new Fill gaps option in the Quantization Options dialog, which tells Dorico to err on the side of using the longest possible duration for a note, to reduce the number of rests in the middle of a phrase (however, it won’t magically make a note you played as a short sixteenth be notated as a quarter note). A new Import CC64 as pedal lines option has been added to the Recording section of the Play page of Preferences, allowing you to choose whether or not Dorico should interpret sustain pedal controllers in MIDI recording and when importing a MIDI file as pedal lines. This is pretty fun on its own, but an extra touch is that a further option, Snap pedal lines to previous beat, snaps the start position of a created pedal line back to the start of the beat as it would normally be notated (even though the point at which the pedal is depressed follows the onset of the note or chord). One thing to be aware of when opening existing projects in Dorico 2.2.10: we have fixed a few related problems relating to spacing and casting off of multi-bar rests and bar repeat regions, which are all beneficial and will produce better and more consistent results, but as a consequence of fixing these problems, the width allocated to single bar rests in part layouts and the results produced by setting the Casting Off values on the Staves and Systems page of Layout Options may differ from the results in Dorico 2.2 and earlier versions. As such, we recommend that if you don’t want to allow the casting off to change when opening existing projects in Dorico 2.2.10, you should open each part in any ongoing projects in Dorico 2.2 and use Engrave > Format Music Frames > Lock Frame to lock the system formatting in your existing part layouts. Be aware that even locking the format of frames in existing projects will not prevent the rhythmic spacing, i.e. the width allocated to multi-bar rests, from being different when you open the project in Dorico 2.2.10, but at least the casting off will produce the same results. We’re sorry for any inconvenience caused by these fixes, but for the long-term health of the software it’s important that we can fix these kinds of problems cleanly when we find them, and in such a way that does not require us to maintain old, broken behaviour for the indefinite future. This does mean that there may be some short-term pain associated with moving from Dorico 2.2 to Dorico 2.2.10, but in the longer term you and every Dorico user will benefit from us being able to keep the program’s algorithms clean and streamlined. In addition to fixing some problems with spacing and casting off, there are a couple of other improvements, in particular that when a staff-attached text item is attached to the rhythmic position that coincides with the start of a bar, the presence of that text item will no longer prevent that bar from becoming the first bar of a multi-bar rest: any ongoing multi-bar rest will be split at that point, but the bar following the text item will now be allowed to be consolidated into the following multi-bar rest. As usual, there are a bunch of other improvements detailed in the Dorico 2.2.10 Version History PDF, including more than 80 bug fixes, so we recommend you take the time to read the first dozen or so pages in order to get a good feel for all of the changes. To download Dorico 2.2.10, grab the updater via Steinberg Download Assistant. Although I wrote the same thing about the release of Dorico 2.2 in November of last year, we anticipate that Dorico 2.2.10 is the final release in the Dorico 2.x series, and the next release will be a major update that introduces significant new functionality (and which will be a paid update, rather than a free one). We feel very proud of all of the new features we have delivered since Dorico 2.0’s release in May 2018, and hope that you are satisfied with the enormous expansion in Dorico’s capabilities you have seen over the past nine months. Although some members of the team have been focused on working towards our next major update for the last little while, we now have the whole team working on foundational work for new features, and we are entering the exciting phase of mapping out exactly how to build what comes next. In the meantime, we hope you enjoy using the new features and improvements in Dorico 2.2.10. If you love Dorico, please tell your friends and colleagues about the software and encourage them to give it a try: there’s never been a better time to jump in than right now. On behalf of all of us in London and Hamburg who build Dorico, thank you. When is looped playback coming to Dorico. I am a composer and I need to be able to select a some measures and have them loop while playing them until I say stop. When do you think this will be added to Dorico? @Mike: Thanks for your feedback. I can confirm that this is on our backlog, but I can’t say when this will be done. The program just gets better and better with each update. Best wishes to the Dorico team, and I look forward to purchasing the next major update. I have been a professional user of Finale since version 1. 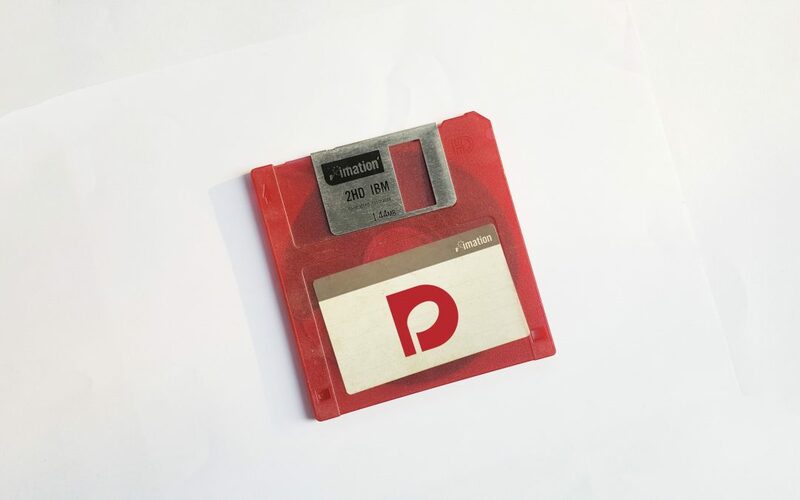 Still use it because some customers request it and I have thousands of files (and because I have to do guitar TAB). Cross graded to Dorico V1 shortly after it came out. I am a big Cubase fan and thought it couldn’t hurt to add a new tool and skills. Since V2, Dorico has become my go-to notation tool. @Mark: There’s no need to update either HSSE3 or HSO with the Dorico 2.2.10 update. I worked long years with finale and then with sibelius. It seems to me that Dorico will be my new favourite notationsoftware. Before this will happen there are some things I am not satisfied, most of them in layout. One question: is it possible to export and import a masterpage-set? I worked hard to make a good layout with everything I need in one project, saved it in this project. But how to get it in another project? @Robert: At the moment you can’t import or export master pages from one project to another, though this is certainly something we will add in future. However, in the meantime, you can use your project with your preferred master pages as a kind of template: do File > Save As to save it under a new name, then in Setup mode delete all of the flows and all of the players. Add a new flow, then add new players, and your new piece will automatically use the master pages you’ve edited in that file. You can also import flows from other projects, or MusicXML files, into this file, and the imported music will also follow all of your settings, including your master pages. Thanks for the infos.All of you are really on a good way. Thanks for the heads-up, Daniel! Assuming you‘re on JIRA for Sprint planning—based on how your issue ids look like. 🙂 Out of curiosity: What does “STEAM” stand for? Steinberg …? @Carsten: STEAM stands for Scoring Team, which was the name we were given when we joined Steinberg, long before we knew that our product would be called Dorico. I still use Sibelius 6.2 on my XP laptop, and on my desktop, for its easy graphic control of velocity (especially for piano mock ups), but with care, I can transfer scores via Music XML. Just wondering, I understand that you do not have a release date for Dorico 3, however, would you be able to tell if it will be released sometime this year? @John: Yes, we plan to release the next major version of Dorico some time in 2019. I’ve posted this question earlier on the wrong thread… Sorry: I’m currently editing a piece of piano music. I would like to know how I could copy ONLY accents: all the piece uses the exact same pattern of accents from start to end (same patter of accents for each measure), but notes do change from measure to measure. Is there a way I can do this without having to enter every single accent for the whole piece? @Serge: You can’t copy and paste articulations independently from the notes to which they’re attached, I’m afraid. You can add them to notes on multiple staves at once, so you could try selecting notes at a particular rhythmic position with Shift+up/down arrow or using marquis selection, then add accent to all of them in one operation. Alternatively, if you’ve not yet finished doing the note input, you csan input the notes and accents on one staff, then copy and paste to another staff and edit the pitches using the Lock Duration tool in the note input toolbox.